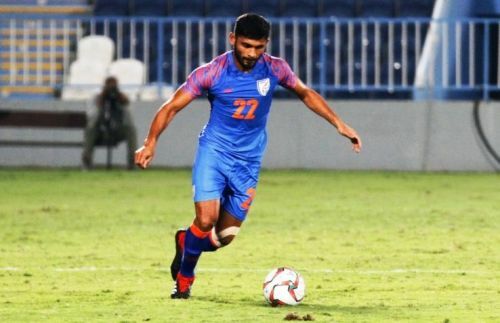 Defender Anas Edathodika announced his retirement from international football a day after the Indian national football team lost 1-0 to Bahrain and crashed out of the AFC Asian Cup 2019. Anas, 31, has been a regular starter for India. He started all three games for India in Group A of their Asian Cup campaign but was taken off the pitch after 4 minutes in the final group game against Bahrain on Monday due to a knee injury. Anas has been prone to injuries for the last couple of years, which has seen him make only 19 appearances for the national team. He suffered an ankle injury in December 2017, which ruled him out for five games in the ISL for Jamshedpur FC. However, he has not been the same since returning from that injury. He missed the first three games for Kerala Blasters this season owing to a suspension. He wasn't straightaway included in the Starting XI by former Kerala Blasters coach David James after serving that suspension. He took his time and has clocked 450 minutes of game-time in five appearances for Blasters. "It comes with a very heavy heart today to announce my retirement from Indian national football team. It’s been a very hard decision to take and accept. I love to play more years at my best, but I think it’s the time to step down and give opportunities to youngsters who can perform better," Anas announced in an Instagram post. Anas has been a dependable defender along with Sandesh Jhingan in the central defence for India. However, the Malappuram-born Anas says he's unable to maintain the same amount of intensity consistently for the national team. "It took 11 years to break into the national team and playing for the national team is the top achievement in my career; although the journey was short. "Each and every time I tried to give more than 100 per cent for the team. I was so disappointed to pick up an injury in the opening minutes and it will hurt me forever." It comes with a very heavy heart today to announce my retirement from Indian national football team. It’s been a very hard decision to take and accept. I love to play more years at my best, but I think it’s the time to step down and give opportunities to youngsters who can perform better. It took 11 years to break into the national team and playing for the national team is the top achievement in my career; although the journey was short. Each and every time I tried to give more than 100 percent for the team. I was so disappointed to pick up an injury in the opening minutes and it will hurt me forever. I just want to say a huge thanks to the coach Stephen Constantine for believing in me and giving me the opportunity and I wish you good luck for the future. Also thanks to all the coaching staffs, teammates, the fans and who all have supported me throughout my journey for the national team. I have been blessed to play for my country, with some of the best players. My heart will forever embrace the feeling of walking through the tunnel and out onto the field donning the national jersey with my brothers. @sandesh21jhingan, we had a good partnership in guarding the central defence, it was an emotion playing with you, Brother. @jejefanai, Trust me, you’re the best room partner I ever had and I’ll miss all these! I wish you all good luck and keep making our nation proud. These memories will stay with me forever, ♥️. Anas Edathodika. The defender thanked coach Constantine and a couple of his teammates in the same post. Anas will still be available for his ISL club Kerala Blasters once he returns from injury. It remains to be seen how long the Kerala native is out.